Journal Journey and Joy! 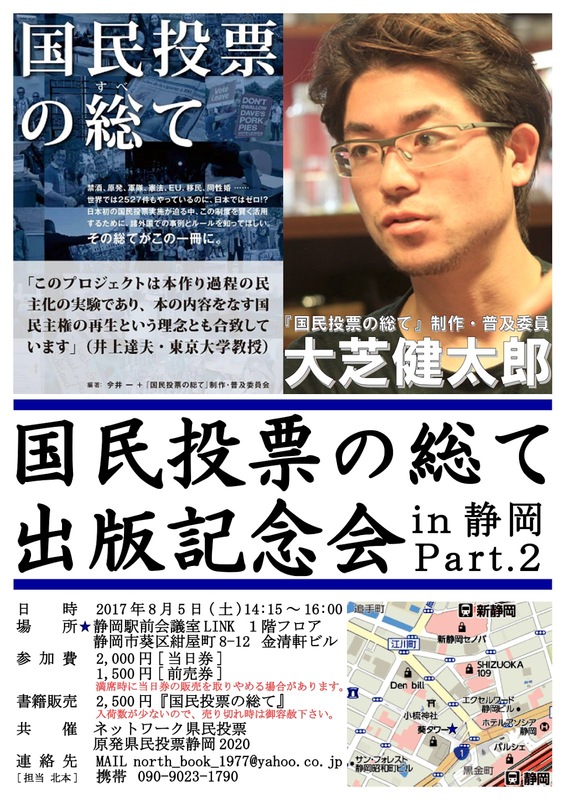 : I will talk about "referendum" in Shizuoka Japan on 5, Aug. I will talk about "referendum" in Shizuoka Japan on 5, Aug. I will talk about "referendum" in Shizuoka on 5th Aug. Shizuoka Prefecture has nuclear power plants by the Suruga Bay. "Hamaoka" the name of it is one of the riskiest reactors in Japan. The first of all, it is expected that a huge earthquake will occur in the near future. The second, Japan can manage electricity without Nuclear power. Japan has enough energy, so we don't have to use risky power plant, but the electric company want to re-use it. It's not only Shizuoka problem because if something happens at "Hamaoka" Japan would be entirely destroyed especially Tokyo, Nagoya. We should talk and "decide" about Nuclear power in Japan after Fukushima disaster. I think Japan needs to do a referendum on "Nuclear power plant". It's possibly held local referendum in Shizuoka about it. I keep an eye on it.